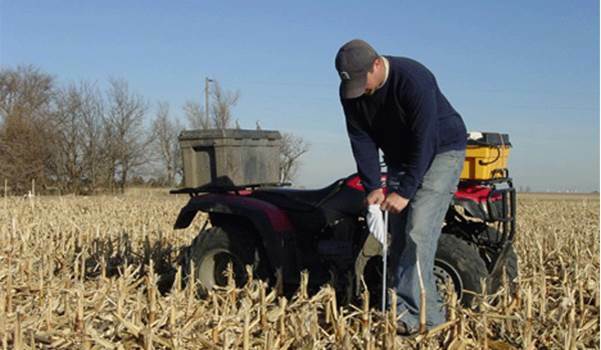 Grid soil sampling has become common practice among farmers across the Midwest. Growers have witnessed the results first-hand how a grid soil sample increases yields and positions crop nutrients in the right areas of the field to maximize their fertilizer inputs. Even though grid sampling provides positive results year after year, many producers elect to have the lowest cost provider grid sample their farms, without understanding what the real difference in cost may be. Grid sampling requires numerous samples to be taken from a field and then analyzed by a lab. Lab analysis of the soil samples is the single largest expense when grid sampling. The second major expense to grid sampling is labor. A properly trained individual(s) must collect the samples and perform the back breaking work. In addition to collecting the samples, a knowledgeable person must use specialized software and have an understanding of interpolation to accurately create analysis and recommendation maps. It is also important that this person have an in-depth knowledge of the different file formats that each Precision Ag monitor uses to do accurate application. This all makes grid sampling an expensive thing to do, but still provides the farmer with a sizeable return on investment. Some grid sample providers can find interesting ways to reduce the price to the grower. One of the most common methods is to reduce the number of samples collected across the field by widening the distance between grid samples which means less cost at the laboratory to analyze the samples. 2 acre or 2.5 acre grids are quite common. This seems to be a happy medium between cost effectiveness and accuracy. Less expensive grids are often done at 4 or 5 acre grid sizes, which will reduce the total number of samples in half, but also sacrifice accuracy of the results. 1 acre grids and smaller would increase accuracy but are usually cost prohibitive and sometime too accurate for the capabilities of the variable rate application equipment. Another way providers reduce costs is by offering a lesser analysis soil package, removing important tests for Organic Matter, Cation Exchange Capacity, and pH. These are important results for every grid sample and should not be omitted. There is also a significant difference in soil sample laboratories and testing methods. Some sampling crews may hire cheap labor that have not been properly trained or lack the specialized equipment to collect samples, using a free phone or tablet app. These free apps are often not compatible with all software platforms, and can only be used with the developer’s software using the developer’s recommendations. Fertilizer recommendations are what truly separate grid sample providers. Some providers offer a cheap grid sample, and then make up for the cost difference by recommending and selling more fertilizer than necessary for the conditions. A quality service provider can customize a program to meet your goals and expectations. He/she can address which results need immediate attention, how much product it will require, and how long the process will take to achieve your goals. Though it is not required, four to six years has become the standard for time between grid sampling. If your plan is different, maybe wanting to be more aggressive and attack fields every three years or be more conservative and take seven or eight years to complete, the recommendations must be modified to meet your goals. At the end of a grid cycle, however long it takes, your soil should be in better shape than when you started. This means soil test results will be higher and less product will be required to maintain soil test levels. A high quality, customized grid program will not leave you fields in the position where you will have to start over rebuilding the fertility levels the next grid sample event, requiring high loads of fertilizer nor will they build you soil fertility to excessive levels. These scenarios are more likely with low cost grid providers. In the end the cheap grid sample ends up costing you much more.